More hunters took to the woods with crossbows.Photo: Dave Kenyon, Michigan DNR. For all the uncertainty and angst that surrounded crossbows in 2009 — the year the Michigan Department of Natural Resources allowed their more widespread use by hunters during the archery deer season -— it seems that only good things have come of it. More hunters are getting out during the bow season. A good percentage said using a crossbow improved the quality of their hunt and season. Some said having a crossbow allowed them to hunt more often while others said they will hunt more often as a result. DNR wildlife staff promised to assess crossbow use and its impact on Michigan’s deer after three years. That was to address the concerns of some in the bow hunting community. They feared the archery season would be shortened if bow hunting ranks swelled suddenly due to an influx of gun hunters and a corresponding dramatic increase in the archery harvest. Critics said the crossbow made killing deer easier and required less skill than normal bows. Crossbows can be equipped with a scope, can be cocked and do not require strength to hold a bolt back without strain. They are fired like a rifle by pulling the trigger. They envisioned an army of crossbow-toting gun hunters invading woodlots and fields all over the state all hoping to extend their season. It was, for many, an insult to their sense of tradition and long-honed skills as an archer. In fact, some gun hunters did enter the bow season using crossbows. And former archers, who had given up on bows, also returned with a crossbow. But the resulting increase in crossbow kills was offset by a simultaneous decline in firearm kills and a decline in hunter numbers overall. The net result was no significant impact on the herd, Rudolph said. Rudolph was referring to the age restriction that was dropped in 2010. It specified that hunters had to be 50 or older to use a crossbow in the northern part of the state. Once that was lifted, crossbow numbers climbed substantially. Prior to 2009, only those with disabilities were allowed to hunt during the archery season using crossbows. The push to expand the season came largely from older hunters who were no longer able to use a regular bow due to aging shoulders or other conditions, and by those who thought crossbows would stimulate interest among youth and make it easier for them to get involved with bow hunting. Their hope was that it would stem the downward trend in hunting participation overall. 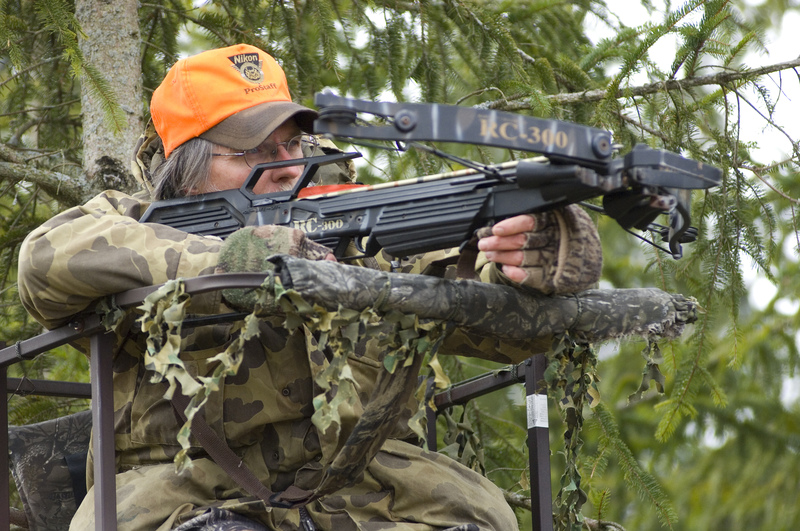 “The main objective in allowing crossbows was to see if we could successfully recruit hunters and to see if it was a sustainable approach to hunting deer. We thought both were possible,” Rudolph said. A total of 77 percent said that crossbows were easier to use, required less time to develop proficiency and were more accurate than other types of bows. The respondents also said they were more confident of killing a deer with a crossbow. The DNR deserves kudos for doing the survey. And crossbow hunter’s need to step-up and get counted more fully: Only 60-some percent of crossbow hunters got the required free crossbow stamp, the one that helps the DNR know who to survey. The future of cross-bow hunting is likely to be secure in Michigan, but without more accurate data in the future, the results will always be a limited snapshot of how crossbow use is impacting the deer herd and hunting in Michigan. • The number of people hunting all deer seasons declined by 7 percent between 2008 and 2011, while the number of deer harvested declined by 13 percent; meanwhile, the number of archers increased by 13 percent and the number of deer taken by archers increased by 24 percent. • The proportion of archers who used crossbows increased from 19 percent in 2009 to 37 percent in 2011. • Archers using a crossbow had higher success than all archers combined and the addition of crossbows to the mix increased total archery success by two to four percentage points. • An estimated 118,573 hunters used crossbows in 2011 and approximately 74 percent of those (excluding those who had crossbow permits for disabilities) had hunted in one of the three archery seasons prior to 2009. This entry was posted in Uncategorized and tagged Archery, Bowhunting, Crossbow, Deer, Deer Hunting, DNR, Hunting, Michigan Department of Natural Resources. Bookmark the permalink. Forgive my ignorance, but crossbows sound like an excellent tool here to me. Deer-hunting is a valuable tool for wildlife management, since severe overpopulation results from us having removed all their natural predators. During a short stint at SCWDS many years ago, I learned about all the diseases of both deer and flora that can result from this. What many non-hunters don’t get, it seems to me, is that deer can die quickly and mercifully when shot, or can die slowly and painfully from disease and starvation. Given that choice, the answer is obvious. I do not understand the objection to crossbows. If they are easier to use, that does not detract from the sportsman triumph of the compound hunter. As you point out, it allows people to hunt who could not otherwise, due to age or infirmity. They certainly can’t be any more inherently dangerous than firearms. Proper safety practices should be applied to all weaponry. Perhaps this will help us move away from the current, unwarranted societal prejudice against crossbows.